Also, I’m excited to announce that I’m now writing and doing photography for Guerrilla Graffiti, a new magazine that launches Tuesday! 🙂 What I’m writing over there is VERRRRYYYYYY different than what I write here (although I will be doing the occasional movie review for them as well) but I’ll be focusing more on women’s issues and social issues especially pertaining to mental disorders and other similar things. So again, if you feel inclined, check it out! 🙂 All the info is below! 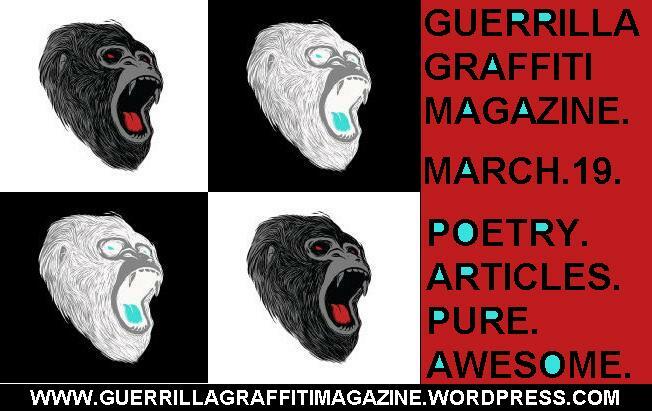 Guerrilla Graffiti Magazine will be launching this upcoming Tuesday. GG Mag is a collective effort of a dozen plus people all putting their honest selves on the page. The site is primarily a lit mag, hosting mainly poetry and short fiction, but it’s so much more than that. GG Mag will also feature great art pieces, reviews and articles that come straight from honest voices the whole world over. GG Mag will also feature some very original pieces including Ut Pictura Poesia, a comic illustrating the haikus of Sarah Elena Kirchmaier. In addition to that, we also will be posting the occasional satire article, our first one being “Fat Cat: An Expose of the Feline Obesity Epidemic in America,” and even a listmaker. Beyond all this, here at Guerrilla Graffiti, we don’t quite know what we have yet. We want the site to evolve organically as it gains an honest sense of community. We hope you will support our small but strong effort and check it out. Posted on 2013.16.March, in Irregular Posting and tagged geek soul brother, guerrilla graffiti, lit mag, podcast, poetry, short fiction, social issues, women in geek media, women's issues. Bookmark the permalink. 2 Comments. Thanks Misty, it was a blast! !